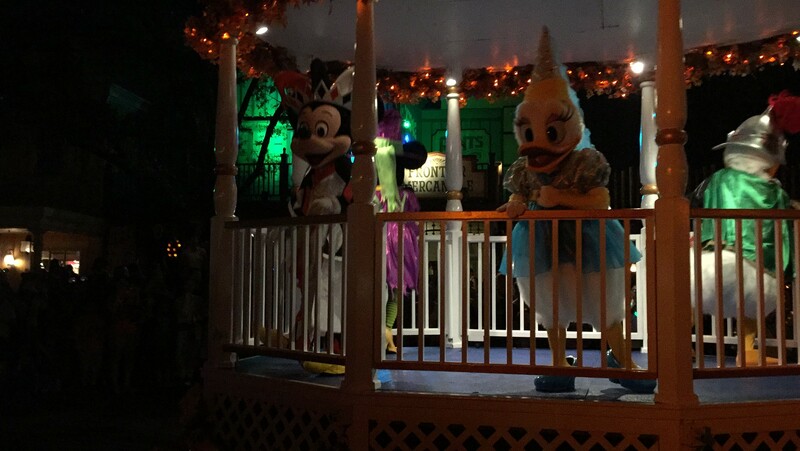 Before school had started in some states, Disney was already ringing in the Halloween season with the 2016 Mickey’s Not So Scary Halloween Party (often referred to by the unpronounceable MNSSHP). My husband and I had gone once in our child-free years, but with our daughter now six years old, we thought this would be the perfect time for a repeat of the party. In the end, it was a marvelous time for us, but we saw a number of families who were having a less than magical experience. Here’s some tips to make the evening truly not so scary. Staying up until midnight on a school night is not the best option for younger children. For this reason, we chose a Friday night leading into the Labor Day holiday weekend. (There are no Mickey’s Not So Scary Halloween Parties on Saturday nights.) This meant that our daughter was in school that day, and we had her take an hour of “attempted nap” between school and heading for the party. If you’re on vacation, you may want to skip visiting the parks altogether on your party night. At the very least, you’ll want to take most of the afternoon for down time to have your best shot at making it through the whole party with everyone in good spirits. It is perfectly acceptable to go to the party without wearing a costume, or just wearing a Halloween-themed t-shirt. For some people, wearing a costume is part of the experience. Hurricane Hermine had pushed through the state less than 24 hours before our party, and thankfully we had selected costumes that could be scaled back for the possibility of rain. Knowing the weather in early September in Florida trends towards hot, we also made sure our costumes would be comfortable in 90-90 weather (90 degree heat, 90% humidity). In the end, we were able to keep a bare minimum of our costume intact and get huge amounts of laughs and love for our simple costume idea. We went as a game of Duck, Duck, Goose basically by two of us wearing white shirts with large wooden signs around our neck saying DUCK (with a small duck figurine) and one wearing a white shirt with a sign saying GOOSE (with a small goose figurine). On the flip side, I saw many families wearing heavy, bulky, and downright uncomfortable costumes–or having their children dressed up in costumes that had no breathability. The heat and humidity will sap your energy faster than anything. Think about your costume choices as if you were going to run a race in it. How will it look and feel when hot and sweaty? Those cute specialty shoes with the costume might be great for going around the block, but how will they feel after putting on several miles of walking? If you must have a certain costume for some of the experience, consider bringing a change of clothes and renting a locker. Here’s an idea of what six pounds of candy looks like. Our family travel extremely light when we are in the parks. It is rare that we ever carry anything that would make us need to go through bag check. For the MNSSHP, a backpack was a must. By the end of the evening, we had removed some parts of our costumes, and a backpack made for an easy way to carry it. We also were able to stash our candy in the backpack so that one of us could help our almost-asleep child find her way out of the park and onto the boat to our hotel. You might also consider following Douglas Adams’s advice and bring a towel. It can provide a place to site on sidewalks that sometimes are a bit sticky with candy. A corner of it can be dipped into water to help cool off an overheating person. And at the end of the night, it makes a good blanket or pillow if you have a stroller for your child. 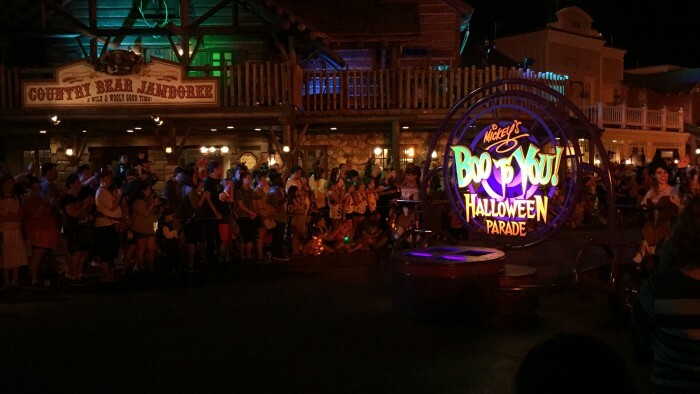 No question, you will see almost every tricks and tips column about MNSSHP advise you to see the second Boo to You Parade. And if you are going with older kids or without kids, this is very good advice, as the second parade is far less crowded. That said, if you have young kids, it is worthwhile to camp out early and see the first parade. 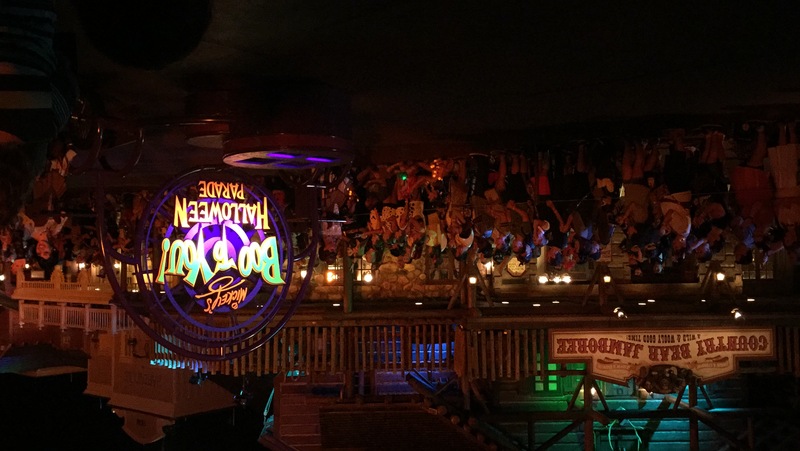 The Boo to You Parade is probably tied for the most exciting part of the whole evening (tied with the Hallowishes fireworks show), and it is possible that by the time the second parade rolls around, your child will be too tired to watch it. Whether you have a cranky child or a child who fell asleep standing up, it would be a shame for them to miss this amazing parade. We picked a spot for the parade a little less than an hour before it started, as we saw crowds gathering. During that time, we got serenaded by the Cadaver Dans, which helped to make some of the time pass. Still, waiting for a parade is never exciting, and with the late hour, it is easy for a child to become impatient. Having some small things to play with, especially if they glow or light up, can help make the time pass by much faster. No one in our family has seen Hocus Pocus (yes, feel free to throw tomatoes), and the Hocus Pocus Villain Spelltacular wasn’t high on our must-do list. Still, for the sake of completeness, we stopped by to watch it. About halfway through the show, our daughter sat down on the sidewalk and asked us to tell her when it was over. The stage show has a couple issues for young children. First, some adults have absolutely no problem moving in to stand right in front of small children. Unless you are a decent distance from the stage or camp out as close to the stage as possible, people will muscle in such that your child will not be able to see without being lifted up and held for the whole show. But more significantly for us, our daughter really had no clue who many of the characters were. She has only seen The Princess and the Frog once and never seen The Nightmare Before Christmas, so the amazing performances by Dr. Facilier and Oogie Boogie were lost on her. Unless you have a child who truly loves villains, this show may lose their interest quickly. Seeing shows at the castle may mean holding your child for a distant view of characters they may not recognize anyhow. When you first arrive, you will receive your trick or treat bag and be herded towards a trick or treat stop. 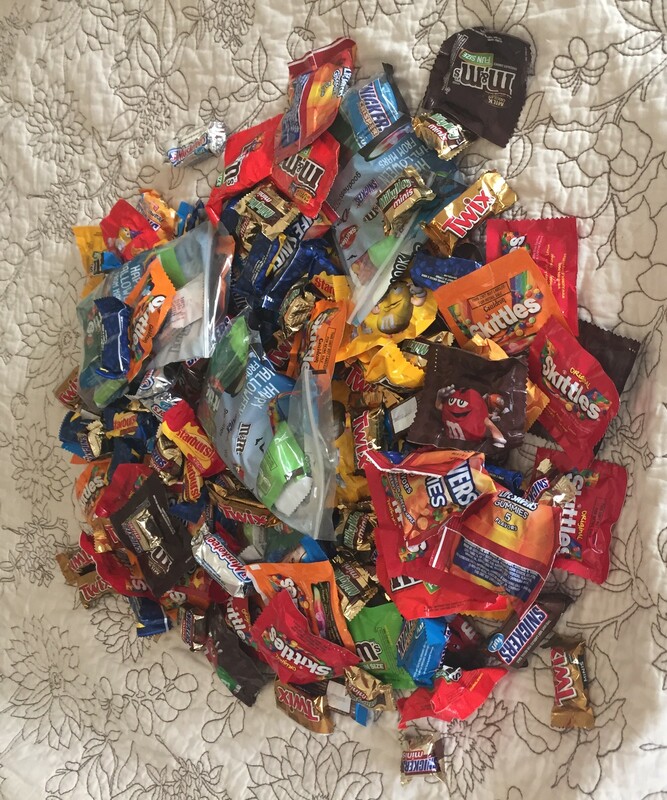 For our child, trick or treating is one of the most amazing things ever, and so we knew that we needed to do a couple treat stations first thing to ensure we didn’t have hours of “Can we trick or treat yet?” On the other hand, those trick or treat bags you receive hold about 2 pounds of candy each. (Yes, we weighed them.) The last thing you want to do is have to carry around double digit pounds of candy for four and a half hours. By ending the night with trick or treating, you can cut the night as short as you need to. If it looks like your child is fading fast, find a treat station where there aren’t a lot of people (such as back in Pete’s Silly Sideshow) and ask a cast member to top off your bag because your child is getting tired and you’re heading out. With your bags full, it makes it very easy to justify to your child that it is time to call it a night. It’s an exciting night, and the possibility for burnout is pretty great. Once an hour, take some time for a quick break doing something more low key. 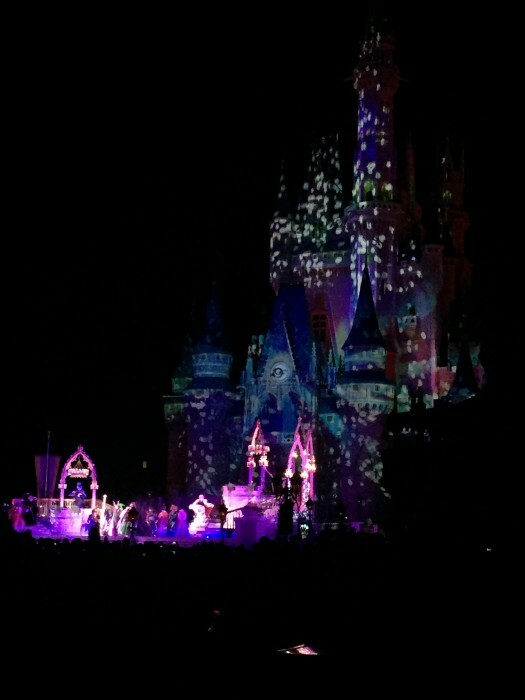 Our breaks for the evening were a ride on the Haunted Mansion, a showing of Philharmagic, a ride on the Peoplemover, and a late-night snack at Gaston’s Tavern. (The pumpkin spice cupcakes were a hit!) By taking 5-10 minutes to regroup, we were able to cool off and keep going longer, and really enjoy the experience more. 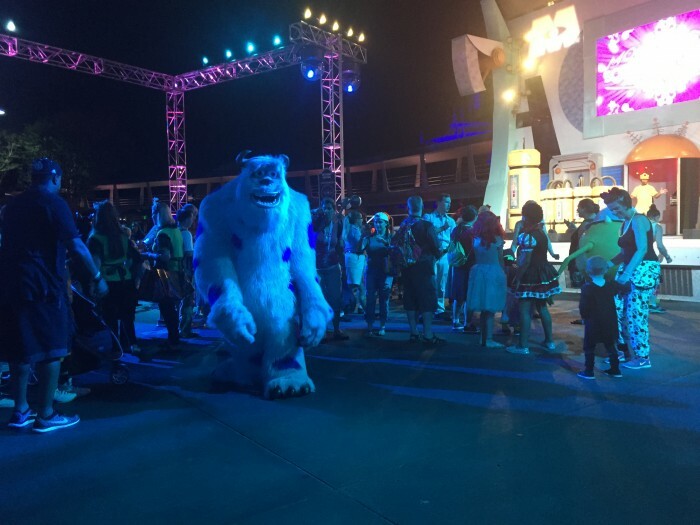 Character dance parties are a great way to see characters without waiting in line. Yes, MNSSHP has some character meet and greets that you won’t see at any other time. Because of this, lines can be long, and that is a quick way to try a young child’s patience. In many cases, you can get close enough to the meet and greet without being in the line so that you can see these unusual characters. Our daughter was just as happy seeing the Seven Dwarves as we walked by than she would have been with a picture with them, and it saved us from seeing her impression of Grumpy. Instead of waiting in line, we let our daughter get as close as she wanted to Mike, Sully, and “Monster” Boo at the dance party in Tomorrowland. The lines for some of the character meets got shorter as the night progressed, but you do run the risk of being cut off at a certain hour. If it is important, make it a priority. Otherwise, wave hi and keep moving. Because this is a hard-ticket event, you are paying a hefty price per hour to be there. The idea of leaving before the party is over means that you are “losing money” on the evening. But be honest in assessing your child’s limits. It is far better to go for three-and-a-half hours of really good fun and leave after the fireworks than it is to force your child to make it to the end of the fifth hour when you both are a crying or screaming mess. Go with realistic expectations about how long your child will last, and what you want to be able to do. Have fun, but know when to say when. If your child is small enough for a stroller, consider having one for later in the evening if your child just wants to go to sleep and you still want to wander around. By figuring out what works for your family, you can make certain that this late-night event really is not so scary. After 11:30 PM, and we’re all still smiling. Duck, Duck, and Goose! Oh my gosh what a cute family! I’m going to be going to the Halloween Party at Disneyland for the first time this year with a group of friends (all late 20’s) so while we don’t have any kids in tow, it’s always great to hear advice from the experts. I’m trying to prep myself as much as possible for it haha. Great advice! 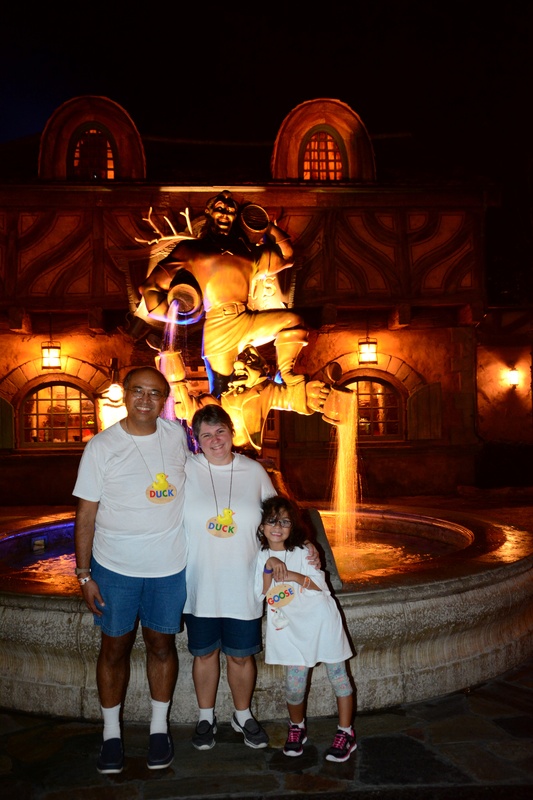 This year will be mine and my daughter’s 3rd MNSSSHP and we have done 3 MVMCP. We have never waited in line for the rare characters. I figure when she is older if she wants to we will. She is 9 now and would much rather do many other things than wait in line to get a picture. We also learned after our 1st party to not wait in line for candy. I know the kids want to get to it quickly, but my daughter realized it was a lot more fun by the end of the night to just walk through the lines without waiting. I’ve never read a more apt Douglas Adams quote. Love it. You are all really hoopy froods. Help yourself to a pan-galactic Gargle-blaster. Just wanted to add a vote of confidence to your “consider skipping the parks on your party day” suggestion. We’ve employed this strategy before with a mid-trip Christmas party. Use the party day as your chance to sleep in and recover from your first couple days, check out Disney Springs, maybe drop by one of the water parks. Because your party ticket gets you into MK at 4, there’s no need to spend a “normal” ticket admission day as well. (Before the Christmas party last year, we did an afternoon boat & monorail tour of Wilderness Lodge/Contemporary/Poly/Grand Floridian to check out all the Christmas decorations, ending the journey at the park shortly after 4).